Today’s small business networks have become increasingly complicated, as it is no longer just about providing a wireless service. Retailers must now balance security concerns with the flexibility of allowing almost any type of device onto the network. 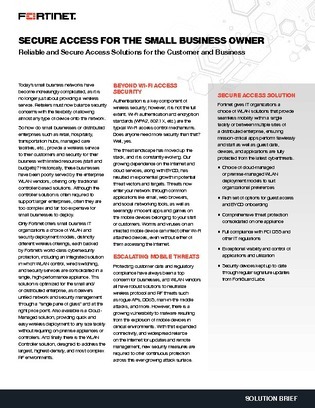 This white paper explains how Fortinet gives IT organizations a choice of WLAN offerings that provide seamless mobility within a single facility or between multiple sites to ensure business-critical apps maintain performance and reliability without impacting security.